For a limited time, we are offering an introductory breeding for $1,500 (This offer ends March 2019). 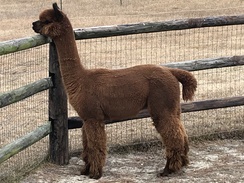 Kahuna will be available for service until late October at Copper Star Alpaca (NY) then at Autumn Acres Alpacas (NC). Contact either farm to schedule a breeding. Snowmass Kahuna Sunrise is the phenomenal Dark Brown, 18-time Champion (and counting) and Get of Sire winning male out of Snowmass Conopa's Kahuna and Snowmass Royal Sunrise. Wow! With lineage from Snowmass Quechua, Snowmass XXXtreme, Peruvian Snowmaster, Snowmass Accoyocusani, PPeruvian Vengador, 4Peruvian Legacy, PPPeruvian Augusto and Peruvian Hemingway, this male has it all! Pedigree, fineness, density, coverage, spot on conformation, consistency, buttery-soft handle and stunning phenotype! Kahuna Sunrise offspring have hit the ground, and they are spectacular! The phenotype and the fleece coverage - not to mention the incredible fineness and consistency that he is stamping on his offspring is exactly what we are all breeding for! His offspring are note worthy and leaving their mark in the show ring as juvies. With Kahuna's elite genetics, we can only expect each one to get better as they mature. 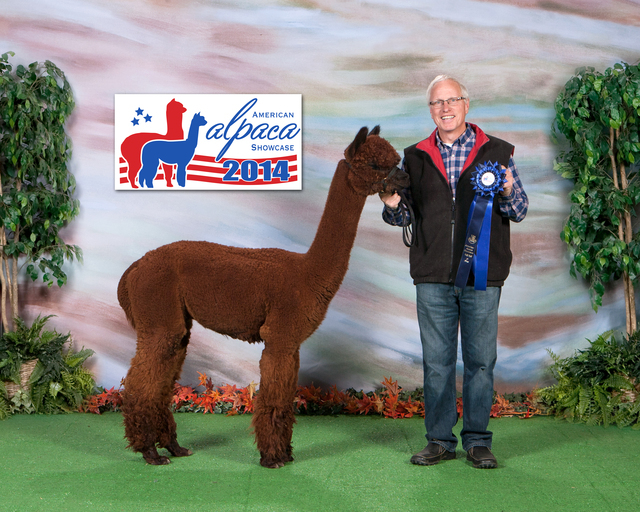 In partnership with Joe & Christy Kyger of Autumn Acres Alpacas, North Carolina.